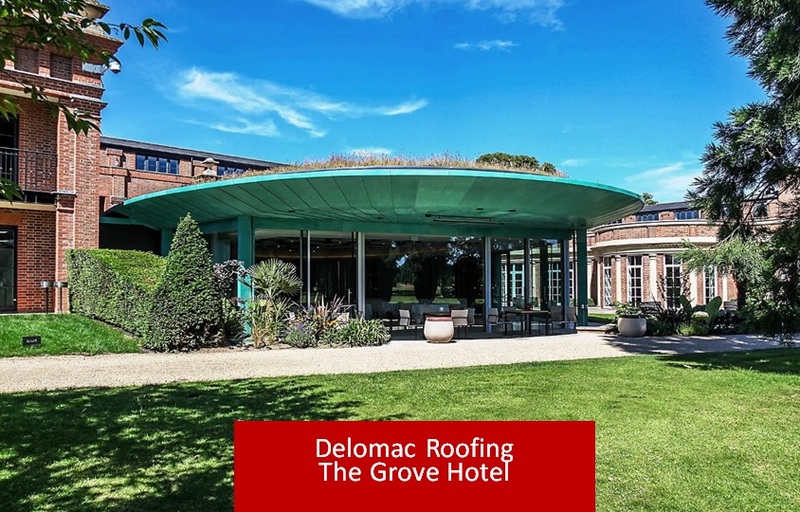 IKO Polymeric’s registered contractor Delomac Roofing has been recognised for the outstanding work demonstrated at the Grove Hotel’s roofing project in Watford. 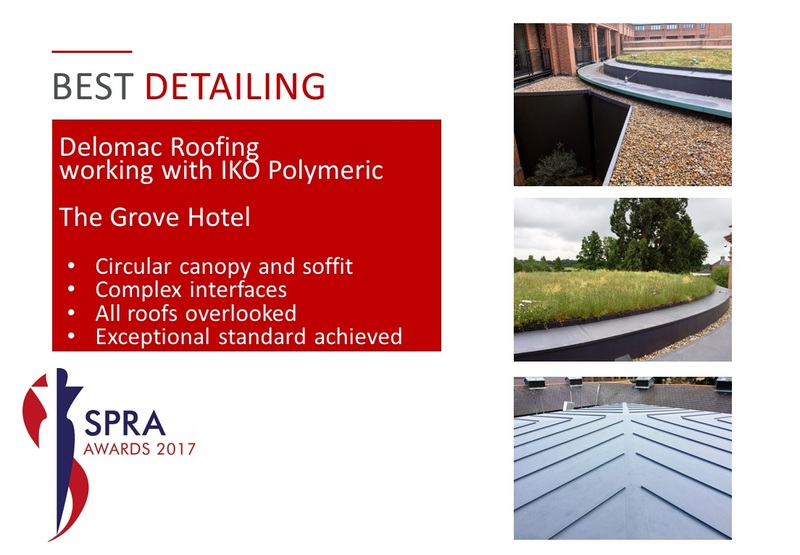 The scheme – including the extension of Cedar Suite, the Golf Complex at Chandlers Cross and the reception area – were managed efficiently between the single ply membrane manufacturer and Delomac Roofing, leading them to win the Best Detailing Award 2017 at Single Ply Roofing Association (SPRA) Awards on 21 June. The extensions were added to the hotel and Golf facilities, sympathetically contrasting contemporary construction elements with the period construction facades of the main building and the surrounding grounds. The Cedar Suite addition was a perfect reflection of the Purcell Architect’s stunning internal finishes. Set to a multi radiused ellipse, the main roof also fell through vertical and curved planes – combining a planted wildflower finish with an exposed perimeter margin working cohesively with the patinated copper slim eaves formation. Similarly, the Golf Lounge extension was enhanced by simple standing seam profiles – delivering a classical appearance reflecting the original build. The extra flexibility of the IKO Polymeric’s Armourplan PSG single ply membrane allowed tight and crisp detailing on standing seams to complement the building’s aesthetically pleasing look. By paying extra attention to details, Delomac Roofing’s qualified installers delivered a very neat finish matching the high standards of the design requirements. The Main Contractor Galliford Try engaged with Delomac Roofing and IKO Polymeric at very early stages, allowing a collaborative and result-driven focus on the project to ensure the first class delivery of the client’s expectations. The client was very satisfied with the aesthetic and environmental qualities, durability of IKO Polymeric’s single ply membrane and Delomac’s high quality standard of workmanship. After winning 2016’s innovation award with a modular school project and being highly commended for the health and safety award with Ocado’s 45,000m2 warehouse roof, this stunning project led IKO Polymeric to another win at SPRA Awards for the second year in a row.